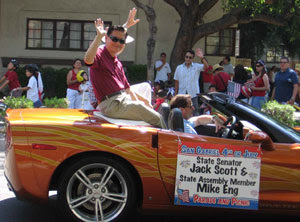 SoapBoxLA: Assemblyman Eng Wants to Park Your Car! Assemblyman Eng Wants to Park Your Car! California State Assemblyman Mike Eng of the 49th District is the Chair of the State Assembly Transportation Committee which oversees the work of the state Office of Traffic Safety, the High Speed Rail Authority, and the Departments of Transportation, Motor Vehicles, California Highway Patrol and Air Resources. He also serves on the California Transportation Commission. Apparently he is unaware of the congestion issues, air pollution issues, safety issues and simple access issues that many in the LA County area encounter on a daily basis. If he was, he would give up on the promise of "free parking" when promoting his community events such as his Legislative Town Hall at USC on Wednesday evening which comes complete with the promise "Parking is free of charge at USC, just simply tell them you are attending the town hall." If Assemblyman Eng wants to make a real impact on the future of transportation in Los Angeles, he'll offer pedestrian, bicycling and mass transit directions to his event. If he really wanted to make an impact, his invitations will come with the promise "the Metro is free of charge, just simply tell them you are attending Assemblyman Mike Eng's Town Hall." How is it that the most powerful people in town can negotiate free parking to their events but they can't get Metro passes? Why do they validate for parking but never reimburse for mass transit? The world as we know it will change when we demand that those in power get out of their cars and walk, ride a bike or take mass transit to the events that they host in our communities. For more information on Mike Eng's Town Hall. To urge Mike Eng to embrace the future of transportation, call Annie Lam of Assemblymember Eng’s Office at (916) 319-2049 or e-mail her at Annie.Lam@asm.ca.gov. But most of all, if you really want to make a difference, get out of your car and embrace the future of transportation by walking, riding a bike or taking mass transit. Metro Red Line 7th and Fig. Get to street level to 7th and Flower, take the bus 81, 381, or 442 from there to Jefferson & Fig. From either of these stops you can walk onto the campus. You can also ride your bike, there is plenty of bike parking all over the campus.